Yorkie gifts, Yorkshire Terrier gifts, Yorkie art, Yorkshire Terrier art: Yorkie dog themed merchandise, accessories and products. Yorkie mugs, salt and pepper shakers, kitchen towels -- Yorkies in your Kitchen! Online shopping, merchandise for Yorkie dog lovers: art, gifts, accessories, jewelry, greeting cards, christmas, home and outdoor decor, apparel & more. More than 2,000 products featuring the Yorkshire Terrier, in 10 product categories! click here to see our Yorkie Christmas collection! Yorkshire Terrier Christmas Tree ornaments, holiday greetings, x-mas cards, Yorkshire Terrier Christmas Cards. Artwork featuring Yorkies (adult dogs and Yorkshire Terrier puppies). Yorkie Christmas Cards. 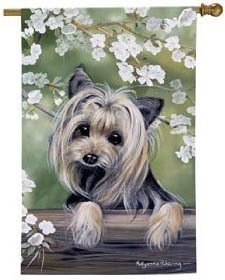 In this category you'll find Yorkshire Terrier artwork: framed and unframed Yorkie art prints, posters, and paintings. Click here to see our Yorkie Art collection! Men's (man), Women's, Children's and baby Clothing with Yorkie dogs. Clothing featuring Yorkies (adult dogs and Yorkshire Terrier puppies). Yorkie shirt, Yorkshire Terrier shirt. In this category you'll find Yorkshire Terrier clothing: t-shirts, sweatshirts, jackets and more, for men, women, children and for babies. Click here to see our Yorkie Apparel collection! Yorkie Calendar. Yorkie puppies Calendars 2010. Yorkie gifts, Yorkshire Terrier gifts. Calendars featuring Yorkshire Terrier puppies, adult Yorkies, a calendar supporting rescue... you choose! Click here to see our Yorkie Calendar collection! Yorkie figurines, yorkie sculptures and yorkie statues. Yorkshire Terrier home decorations: pillows, throws, blanket. 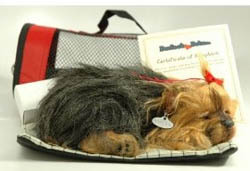 Yorkie gifts, Yorkshire Terrier gifts. From Lil' Snoozer figurines to Lifesize Yorkie sculptures. 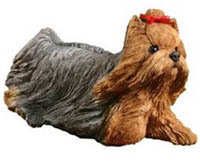 Click here to see our Yorkie Figurines collection! Dozens of Yorkie pillows, throws, afghans and blankets to choose from. Click here to see our Yorkie Tapestry collection! Yorkie figurines, yorkie sculptures and yorkie statues. Yorkshire Terrier home decoration: pillows, throws, blanket. Yorkie gifts, Yorkshire Terrier gifts. Yorkie shirts. Lovely Yorkie charms, earrings, pendants and much more! 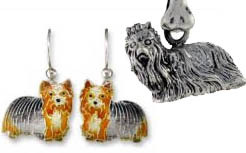 Click here to see our Yorkie Jewelry collection! Click here to see our Yorkie Outdoor collection! Yorkie jewelry (jewellery). Yorkie earrings, charms, pendants. Yorkies in your garden: Yorkie flags, welcome signs, lifesize Yorkie garden sculptures. Yorkie gifts, Yorkshire Terrier gifts. Plush and stuffed Yorkie dogs, toys for Yorkie lovers of all ages. Yorkie clock, business card holders, umbrella, door topper, and much much! Yorkie Dogs - Gift, Merchandise Accesories and Products, Collectible Yorkshire terrier Dogs, Collectibles in our online store . 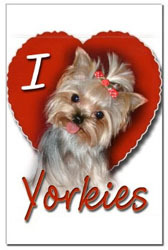 Yorkie gifts for Yorkie lovers, Yorkie gifts for people (humans). 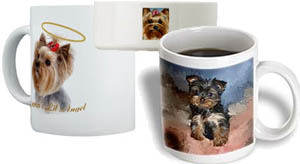 Yorkie dog breed gifts, art, products, merchandise and accessories.